Song info: This song samples part of Mozart’s “Piano Sonata No. 11 in A major, K. 331 – Andante grazioso.” As with all of the songs from the Koufuku-ron single, the lyrics are about the boy she dated when she lived in Fukuoka. 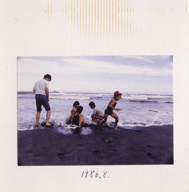 The artwork for the re-released single this song appears on is a photograph of a 7-year-old Ringo at Kujūkuri Beach, located on Chiba prefecture’s Bōsō peninsula (房総 bousou) – a homonym for the 暴走 bousou in the title. Info: Ringo originally wanted to release the B-side as her debut single, but was overruled by her label. Wikipedia. Info: After an increase in popularity, Ringo’s debut single was repackaged as a 12cm disc and re-released on the same date as the Honnou single release with a new third track and new artwork (which is a photograph of a 7-year-old Ringo at Kujūkuri Beach, located on Chiba prefecture’s Bōsō peninsula (房総 bousou) – a homonym for the 暴走 bousou in the new track’s title). Wikipedia. Song info: As with all of the songs from the Koufuku-ron single, the lyrics are about the boy she dated when she lived in Fukuoka. Wikipedia.